These snaps have been taken earlier in the season by Jack McInroy. I didn't post them on here at the time, as the idea was to do individual profiles by each player. But I've come to the conclusion that I haven't had the time to sort these out, nor will I get round to it! So, rather than leave them launguishing unpublished in draft, I've decided to put the whole lot up now. Once again thanks to Jack for both taking the photos, and loading them onto here. at Perry Street, Crayford, Kent. On an ‘ordinary’ Saturday morning this would be a difficult match for “The Rabblers”, never mind following a Friday night First Team game 6-1 Champion Hill stuffing of Sittingbourne, in front of our guests from over the English Channel, our old muckers from UR Namur, & a night of roistering not just in the Hamlet bar, but into the early hours at the ‘East Dulwich Tavern’ & beyond! And now, with severe hangovers in tow, apart from Shaun Dooley going strong, who left the Belgians at their lodgings at 4.30am, only to have a quick powernap back home in Nunhead. And a few hours later here he was, with a can of Stella Artois still seemingly ‘superglued’ to his hand! Welling were clear favourites for this match. 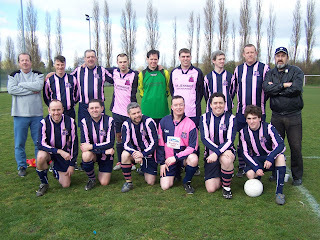 After all we had yet to be victorious in an IFA match all season, & they were easily in the top twenty! We were again a ‘mix and match’ side, from our veterans, to a few of our younger players, & with James O’Shaughnessy being available we even had a rare teenager in the side. But still, we were the underdogs, & it was a simple case of ‘get stuck in & fingers crossed’ that we wouldn’t get as much of a hammering as our previous IFA game when we leaked thirteen for no reply against Watford! But as the game got into it’s stride it was the Hamlet who were holding their own! And were certainly not overawed by their Kentish opponents, who looked both fitter & younger. 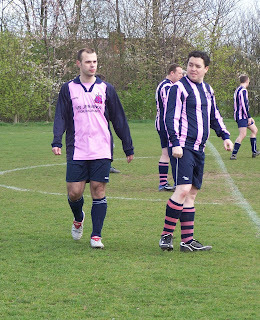 Not only were we matching them but we scored a goal that old Hamlet hero, Peter ‘blobby’ Garland would have been proud of! The ball fell to Jack McInroy a good thirty yards out, if not more. Glancing only momentarily to glance skywards asking for help from the Lord, he hit the ball and it sailed sweetly over the home keeper & into the back of the net! 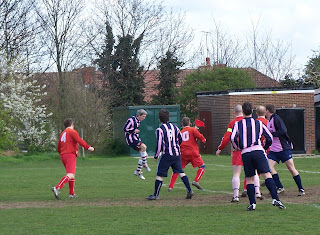 Bringing back memories of THAT Peter Garland goal from the halfway line, all those years ago, at Gravend & Northfleet. Yes, that goal where a large numbe of Hamlet fans caned the on site bookies, with Blobby at 5 to 1! Now Jacks’ not a gambling man, so I hope the money he saved ‘backing himself’ this morning, he popped a few shillings extra into his Sunday collection plate to give thanks to his goal! Who would have thought that only fifteen days after Ferenc Morath became our ‘great old ancient’ by scoring at the age of 47, that forty eight year old fatherly Jack would usurp him? Magnificent! Half time came, barely a second played for stoppages on our watches, & the talk in our camp was to keep it tight, hold onto the lead, & not throw it away. All too often in the past, we take the interval as time to completely switch off, failing to turn ourselves back on, conceding a goal or two before we do. Not today! Not long gone in the half and James O’Shaughnessy smacking the ball into the back of the net from the edge of the box! 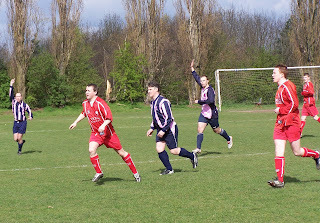 A quality goal, from a quality player on his day, when he’s not sulking like lazy Kevin the teenager! But today he had one of his best performances for us. Welling came back strongly, and attacked in waves, although we did have our chances too. What made the game interesting for me, watching from the sidelines, was how undisciplined the Welling lot became. They play under the banner of their fanzine ‘Winning Isn’t Everything’, but the way they whinged for England you would have thought otherwise. Constant ear bashing of THEIR referee, who I thought gave an extremely competent performance, & even arguing amongst themselves, when things weren’t going their way. It was actually enjoyable to watch. On the downside they managed to influence the referee enough to pressure him to add time on every time the ball went out of play behind our goal, & claimed, somewhat unfairly that Andy was timewasting each time they missed the target & the ball ended up halfway across the pitch. If they really were that bothered they had enough subs on the sidelines to ‘act as ballboy’! They did pull one back, it would be a bit ‘harsh’ to mention the last touch was from our own Nicolas Lucas, and that it was an own goal, but we still should have held on for the win. But, with all the time added on, a couple for knocks, the rest for Andy supposedly taking so long to get the ball back, I made it five minutes AT MOST of stoppage time. Where on earth they found time to equalize an amazing twelve minutes after the ninety were up I just do not know. I’m not saying they didn’t deserve a draw, but if they wanted it that much, by not earning it fairly we may as well have gone back from the kick off & scored the winner for them, if they were that desperate. As it was ‘drunken’ Dooley almost snatched a winner for us! Now that would have been sweet, though not to be! A cracking point, and a superb performance from us, against a very good side, despite their constant moaning! Personally I wouldn’t like to pick a man of the match for us. I know they were impressed with Andy Murphy, but you could also have chosen James O’Shaughnessy, Nicolas Lucas or John Prendergast, to name but three. Team: Andy Tucker; Phil Doyle; Jack McInroy; Nicolas Lucas; Larry Marsh; Ian Gannon; Steve Rickerby; Chris Garrett; Shaun Dooley; Andy Murphy; John Prendergast; James O’Shaughnessy; Ian Wright. Marsh; Ian Gannon; Steve Rickerby; Mark Hutton (co-manager). Stop waving at the crowd! "Putain! "...as they say in Belgium! 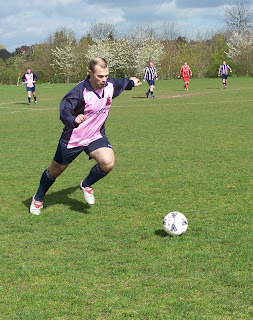 to becoming our oldest ever goalscorer at 11-a-side! & one last one of the Belgian! The idea, I think, was to have a bit of fun, & to raise some money for the family of a chap called Stephen Benjamin. Who was he? I have no idea, simply an ordinary bloke who had a heart of gold. One of the wide family of footballers, who no matter where we are, or who we are, we all have an affinity. Stephen played for Old Westminster Citizens 6th XI, & tragically collapsed & subsequently died early this year, aged only 35. On Easter Saturday his Club, Old Westminster Citizens, of the Southern Amateur League, held a tournament in his memory, and as a benefit for the young family he left behind. We didn’t know what to expect standard wise, but were under the impression there were to be a number of mixed sides in the tournament. Unfortunately that wasn’t to be the case, & we were the ONLY mixed side there, which put us under a severe handicap! Though the outcome didn’t matter one iota, it would have been nice to have been on a level playing field! And whilst the actual pitches were flat & reasonable to play on, you couldn’t quite be so complimentary about the weather! There was some sunshine, but not much! Mostly strong winds, rain & even hail! Boy oh boy was it cold! We were in Group A & matches were of a quick turnaround. 25 minutes a match, I think it was, & almost straight back on. Which wasn’t a bad thing, it actually ran extremely smoothly, all credit to the organisers. Our first match was against a team called Accentuate The Passion, where we held out for a no score draw, our only point. I’m not sure who this team was, but I think they were made up of friends & family of Stephen. 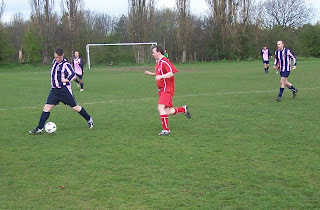 Our next match was a 2-0 reverse against Champions 06/07, who were the Old Westminster Citizens 6th XI team that won their league last season, & the actual team that Stephen turned out for. It was fitting that they went on to win the tournament, defeating RAF Icarus one nil in the final. Our last clash was against Old Wilsonians. A somewhat calamatic first half saw us turnaround three goals down, but we battled on and managed to ‘win the second half’ one nil with a well taken goal from Villager Lizzie Cameron. 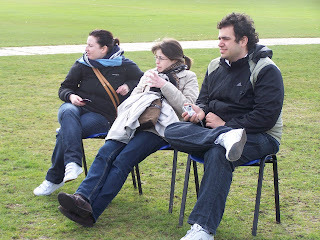 So that was the end of the group games, but the competition wasn’t over for us, despite aching limbs wanting it to be. 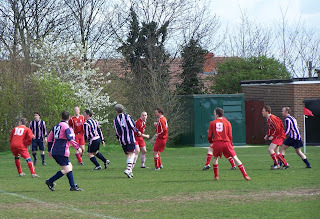 We were due a couple of play-off games, though there were no complaints when one team had gone straight home after their elimination, so it was just the one against a fellow supporters’ team, & Internet Football Association rivals, Hampton & Richmond Borough, who were generously stopping off on their way to our own Champion Hill to paly out senior tenants Fisher Athletic, to take part this morning. By now we were so knackered that we were running on an empty tank, & were well beaten-six goals for no reply. And so it was time to get changed and jump into cars, taxis or public transport, & head back to the comfort of a warm & welcoming ‘East Dulwich Tavern’! Hopefully we will be able to enter again next year, if Dulwich Hamlet fixtures allow. Though I hope that it will be a solo Dulwich Hamlet Supporters’ Team, and not a mixed one. Though I had no problem with the mix it did put us at a distinct disadvange, having falsely been led to believe that there were other mix & match sides taking part. That’s not a slight on any of the Peckham girls, some of whom could easily slot into a ‘Rabblers’ team, especially the strong & powerful Terri Warren. Not so much a ‘she-man’; more of a Sherman Tank! Peckham Village: Oli Cole; Terri Warren; Liz Cameron; Sarah Keane; Reanne Jones; Vicky Ross Jen Radman & the aforementioned Dawn. Peckham Village lads: Ben Woodroffe; Dave Hamill & Stan Pezic. On behalf of Sarah & other members of the Benjamin/Gulley family I can’t say how much I appreciated the arranging of Saturday’s event and your thoughtfulness in naming the tournament after Stephen, and providing certificates for all the participants. Somehow ‘thank you’ cannot express how I feel about all you have done and the resultant debt we owe you, and all involved in the event. I was deeply touched by the high attendance and the level of commitment shown by all to making the day a success, especially given the ghastly weather. It just goes to show the measure of people in the football family, and I was humbled and honoured to be present. Once again thank you Ian. That moving letters shows exactly why it is right to participate in such events, & I hope everyone who was there on the day appreciated that. I never met Stephen, in fact I'd never even heard of him, barely knew even about Old Westminster Citizens FC. But one of your members Ian Gannon has refereed Dulwich Hamlet Supporters' FC, & as a result now watches our First Team & turns out for us now & again. Somehow when someone dies young it hits you so much more if they are from your extending 'footballing family', rather than say being knocked down by the proverbial bus, silly as that sounds. When Ian mentioned this tournament we had no hesitation in entering a joint team from ourselves, "The Rabblers", and Peckham Village Womens FC, who one of our supporters' plays for & runs.The weather was awful, but it didn't matter. Perhaps Stephen was playing a little joke on everyone as he looked down from the comfort of the clouds above, 'in revenge' for all the muddy & wet wintry days he had to 'endure' turning out for you lot over the years!It was fitting, and moving, that his own team won the competition. He sounded a wonderful bloke, and I'm sure all of those who knew & loved him will cherish the memories of his life, as time goes by the hurt will fade, but never disappear, and as the tears dry the laughter will come back as you remember him.I've worn the t-shirt a few times, & a couple of people have asked me what it's all about. And all I can say is that it's a dedication to a wonderful man I never knew.Deepest sympathy to all his family & friends, both in football & beyond. On behalf of both myself, & all at the Dulwich Hamlet Supporters' Football Team. Wealdstone Supporters’ are holding their second five-a-side tournament on the late May Bank Holiday Monday, the 24th. Wealdstone FC Supporters Club (WFCSC) are delighted to announce details of their second five-a-side tournament to held on the second Bank Holiday in May at the clubs new home at Grosvenor Vale. WFCSC hosted a similar event in 2003 held at the Roger Bannister Stadium in Headstone Lane which was won by Hitchin Town FC. This years tournament promises to be another fantastic event and will follow the junior tournament which is being run on the Saturday and Sunday of that weekend. Firstly and foremostly, this is a supporters tournament and all teams must represent a club. This is not open to 'generic' Sunday league sides. Where possible, supporters should wear their teams colours. There will be an initial group stage containing five (maybe six) teams who play each other once in a round robin format. The top two teams will go foward into the cup knockout stages while 3rd and 4th will enter the plate competition. The last placed teams will be sent packing, tails between their legs. Both the cup and plate tournaments will be a knockout stage with the winners progressing. Each team will guaranteed at least 45 minutes of football. Games will be played on the grass pitches outside the main stadium and will have hockey sized goals. The cost will be £40 per team to join and each team can consist of upto but no more than 8 players (works out at £5 each). All payments must be paid for before the first game. To register an interest please send an e-mail to Adam Hills with details of who you are, what team you will be representing and how many teams you wish to enter. I know Mick has sent out an email to gauge the interest, but surely we can-hopefully- manage to knock up at least one side. It is only five-a-side after all! As one of the teams who entered the previous one five years ago it would be nice if we could muster enough interest to take part again. Domestic tournaments used to be a major part of “The Rabblers” close season activities, but interest has waned over the years. Some tournaments have had their day, some lamented by myself, others not so much. But they are still out there, including the Wivenhoe Town tournament; which we also haven’t entered for a good few years. I’ve never kept full records of all the ones we’ve taken part in over the years, but I wonder if any of the these stir any memories? & not forgetting our own 5’s which ran for a few years. There may be one or two more, but these are the ones I can recall, off the top of my head. Can anyone remember others we have participated in down the years? I’d be interested to know what people can recollect of these tournaments, good & bad! I hold my hands up and 'take the blame'. We came, we saw, we almost conquered! It's a good few years since we ventured down to the South Coast, for our only previous match against the Rebels supporters. No win for the Hamlet fans this time out, & thankfully no own goal from Mishi Morath against Matt Hammond, as he was rumoured to have 'bottled' the trip, fear a 'phoenix from the flames' type scenario! As it was there was only adozen who made the early journey down to Sussex, ranging from the old to the ancient, with a couple of youngsters thrown in! By 'youngsters' take that to mean late twenties, & NOT the genuine strapping young pups, who wore the Worthing red. Indeed one or two of them wouldn't have looked out of place in the Worthing Youth Team, & it was rumoured that the odd one had! We were fortunate to meet up with London based Rebel Nick on the train, so he led us straight to the ground. It was somewhat strange to stroll to an away game alongside fields and horses! On getting to the pitch we were met by a large Worthing squad, most of whom were younger and fitter. There was an almost gale force wind blowing across the pitch, and it was on a slope! Memories came flooding back of schoolboy football matches at Brockwell Park! If ever there was a team for which the expression 'underdogs' was invented then it was 'The Rabblers' today! But strength in adversity, we didn't just take an early lead, but went into the break three one to the good! It was a superb performance from everyone involved, and it was only weariness that got the better of us at the end, as Worthing fought back to earn a draw. I'm not entirely sure they deserved honours even, but given their youth it came as no surprise. 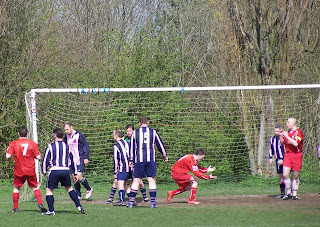 They were perhaps helped slightly when Andy Tucker unilaterally opted to come out of goal in the second half, to play out on pitch, as although stalwart Steve Rickerby did an adequate job between the sticks, I think even he would hold his hands up and say we would have won if he'd stayed in the centre of defence, with Andy still between the posts. The result, although a little disappointing, was one I am sure most would have settled for before the match. And it must be said that this was a true supporters' game as they should be. Great fun, without a hint of malice. A pitch full of people running around, who really should know better at their age! Marvellous! The goals came from a brace each through Lawrence Marsh & Chris Garrett. One of Chris' efforts being from down the wing, as he went forward & cut in, almost reminiscent of his wondergoal against the PSG Belgium fans in Paris early last year. And what can you say about the last goal from maestro Marsh? A superb assist from Mishi Morath from the centre spot, as we kicked off having just conceded, as he knocked the perfect pass to his feet. 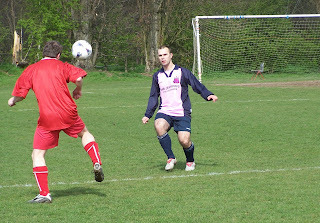 Larry then took a step or two forward, looked nochalantly up & struck the ball sweetly into the back of the net, probably on a par with that famous David Beckham strike against the now Milton Keynes based Wimbledon FC a few years ago on 'Match of the Day'! And what about the evergreen Ferenc Morath. It's been a while, but he's back on the scoresheet for us. A somewhat over the top celebratory run back up the pitch followed, after he hit the back of the old onion bag. 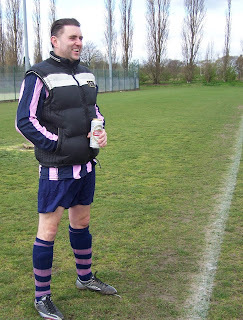 The onionbag being almost as old as himself, as at the 'youthful' age of 47 he becomes our oldest ever 11-a-side goalscorer! I wonder how long it will be before he hits another, or someone else takes that mantle off of him? It was good to see Shaun Dooley have another run out, he's almost a regular now with this being his third appearance after a decade or so absence. And a first run out of the current campaign from the mercurial Lee Shailer. Not to mention Darren Nicholas, making only his second turn-out for us this season. Well done to everyone who played, against a younger, fitter & numerically stronger Worthing side, who were worthy opponents. If you really want to judge the gulf between the two sides, which tells you what a magnificent result this was for 'The Rabblers': our threadbare squad of twelve included two over fifites; three over forties & only two UNDER thirty year olds! Team: Andy Tucker; Mick O'Shaughnessy; Steve Rickerby; Shaun Dooley; Phil Baker; Lee Shailer; Mark Hutton; Darren Nicholas; Lawrence Marsh; Chris Garrett; Ferenc Morath & Mishi Morath.